Her Majesty Queen Elizabeth II and His Royal Highness The Duke of Edinburgh will visit Oman on 25-28 November 2010, at the invitation of His Majesty Sultan Qaboos Bin Said Al Said, to celebrate the 40th Anniversary of The Sultan's reign and the strong relationship between Oman and the United Kingdom. There are two opportunities for members of the British and Commonwealth community to experience the visit (other events by invitation only). The attached letter explains what they are and how you can participate. Her Majesty Queen Elizabeth II and His Royal Highness The Duke of Edinburgh will visit Oman on 25-28 November 2010, at the invitation of His Majesty Sultan Qaboos Bin Said Al Said, to celebrate the 40th Anniversary of The Sultan’s reign and the strong relationship between Oman and the United Kingdom. The British Embassy would like as many members of the British and Commonwealth community as possible to have the opportunity to participate in the visit. The Horse Show: The Sultan’s horses and some of the best horsemen and women in the country will perform for Their Majesties for just over an hour. All members of the audience will be seated, but will need to be in place for at least an hour before the show begins. The show will take place in the afternoon. Both events are outside and will involve protracted waiting times, so may not be appropriate for very young children or those with special needs. For security reasons, we are not able to confirm precise timings or locations at this stage. Since space is limited – 200 tickets for the Official Welcome and 300 for the Horse Show – we will hold a lottery to decide who gets a ticket. In order to give as many people as possible the chance to participate, please only specify attendance at one event or the other, not both. If you wish to enter the lottery, please send the form below (click here for the form) to the Embassy’s Consular Section by fax: 2460 9011 or by email: muscat.consular@fco.gov.uk, by 14:30 on Monday 25 October. Those successful in the lottery will be notified by email on Wednesday 27 October and will be given further details about the event they will participate in next month. Why not?? 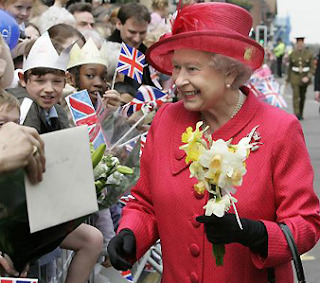 It's easy to find out what The Queen is up to in the UK weeks in advance, so why the problem with security here? Is Oman more risky than the UK?? I assume people will still be able to stand by the side of the road and wave to the royal party? Why would any one want to waster his time just to gawk at the queen? You can't stand by the side of the road and wave if you don't know where they are going to be - which I guess is the whole point of the invitation. Some people WILL want to do that although it's not my cup of tea so to speak. As for security she is a head of state visiting another head of state - so obviously there is a need to keep details quiet for as long as possible - and in any case we are not in the UK we are (guests) in Oman as is QE2. So we do it their way. I doubt if the Queen will be paying it though! Somehow I will not be taking part in this raffle.As a Brit who has spent a long time in this country promoting the UK I feel rather miffed at being told to apply to a lottery!! Perhaps HM Inland Revenue would like to toss a coin with me, for my tax or no tax?? Somehow I don't think so! (be invited) but I have heard that this "lottery" has been scrapped! Not enough applicants!!! !